As you know, displaying retail items in a visually effective way is a large part of what helps them sell, and hang tabs designs from Do-It can help you with this problem. While shopping, the first products we typically see are those at our eye-level. Some products may be able to sit on a shelf that is raised up for our viewing, but, for those that can’t, our hang tab designs are sure to give them the vertical boost they need to boost sales. With Do-It’s many hang tab designs, you are sure to find to find the right one for you. Offering 14 different designs of interior and box top hang tabs, you have options to find the perfect match to stick on your product. Holding anywhere from 170 grams to 397 grams, there is a hang tab design for you, whether your product is light as a feather or a little heftier. 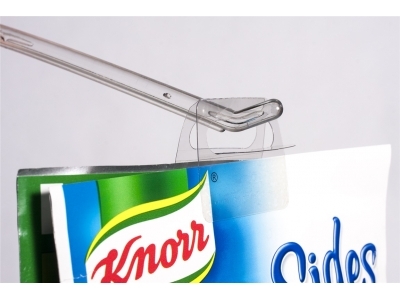 Do-It not only offers a variety of hang tabs but does so in an eco-friendly way. All our hang tabs are made from a recyclable plastic, so after your they’ve held up your product and grabbed a customer’s attention, that customer can then recycle the hang tab along with the item’s packaging. If you’re still unsure of whether our hang tabs will hold up your products, contact our hang tab test center and get the information you need to help put your mind at ease. Our testing area makes sure every hang tab design that we come up with stands the test of time and even how well they hold up to customers handling them. The Do-It Corporation has provided hang tab and point-of-sale display solutions for over 40 years. As one of the largest hang tab manufacturers in the world, we guarantee we can help you find the answers you’re looking for.